What's the solution? How do we feed, clothe, house, and transport 8 billion humans? 8 billion? How did the population jump by a billion overnight? Yup they had a definite way to record those temps back then. I'm glad they have this all figured out and cleared up!! Not my science, unlike you I always supply valid reputable links...Fantasy and misinformation is your department, no matter what subject is being discussed....And that is the polite version of what I think of your posts. I suppose ocean acidification due to increased levels of atmospheric CO2 isn't occurring either, right? 7.6 billion or 8 billion. What's your solution? What evidence do you have to come to this conclusion? 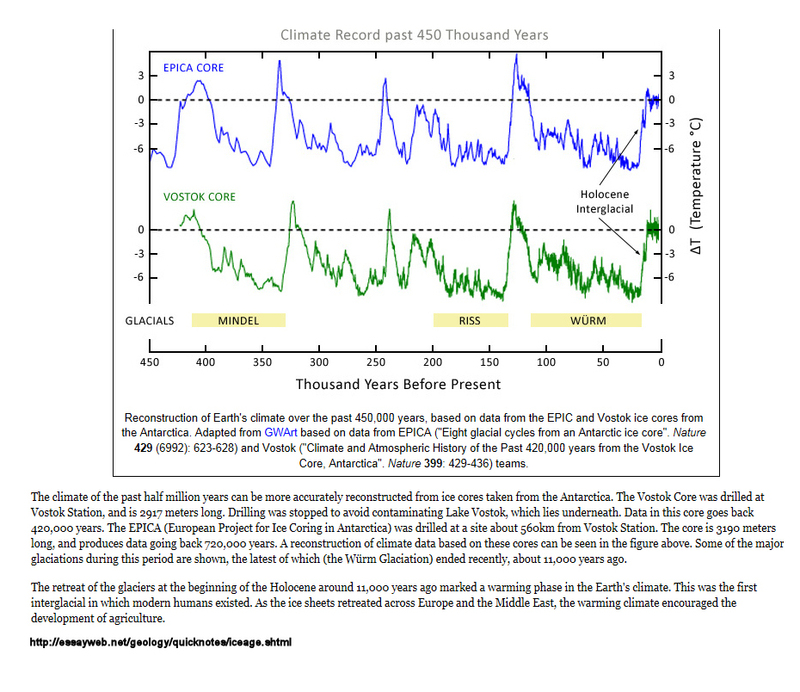 Climate change has been going on ever since Earth has had a climate, of course, as the chart below clearly shows. The Manmade Global Whatever fanatics might be interested to know that the current warm period they are so worried about, began approx. 10,000 years ago, sometime around 8,000 B.C. (see "Holocene Interglacial" at the right of the chart). Damn those 10,000-year-old cave men (or whoever existed back then) for driving their SUVs all over the planet, running all those power plants, cranking those R12-filled air conditioners, and spraying all those aerosol cans with so little regard for the environment. LOOK what they did to our planet!!! And even more shocking... it wasn't the first time. The same thing happened 130,000 years ago, too! How could all the dinosaurs, giant ferns, and microbes that populated the Earth back then, look at themselves in their mirrors every morning (surely they had mirrors) with any good conscience, knowing what they had done to our poor planet? Do you know how BIG an SUV a brontosaurus needs, just to fit inside? That thing must have been huge. How much pollution must a juggernaut like that have put out? The climate never stood a chance. Oh, wait, they did it again, 240,000 years ago! And again, 320,000 years ago! And again..... Oh my God. in other words you design buildings, and the heating and cooling systems there in. that does NOT make you a climatologist. This thread serves to highlight a major problem that occurs when people who have little or no education in science jump into the middle of a scientific debate. The complexities and subtleties are completely missed, or misunderstood. ."
It isn't about science. It's about politics. And if you make enough predictions, some of them will be true. Predicting the future is a useless exercise, but it sure does employ a lot of people at a very high cost to the taxpayers. Clearly this issue is not fully understood, despite rising CO2 levels for many years and the last few years are no different, we have many years of no warming, years which goes beyond explaining it by a rare anomaly. "Global warming appears to have stalled. Climatologists are puzzled as to why average global temperatures have stopped rising over the last 10 years. Some attribute the trend to a lack of sunspots, while others explain it through ocean currents. Ironically, climate change appears to have stalled in the run-up to the upcoming world summit in the Danish capital, where thousands of politicians, bureaucrats, scientists, business leaders and environmental activists plan to negotiate a reduction in greenhouse gas emissions. Billions of euros are at stake in the negotiations. Just a few weeks ago, Britain's Hadley Centre for Climate Prediction and Research added more fuel to the fire with its latest calculations of global average temperatures. According to the Hadley figures, the world grew warmer by 0.07 degrees Celsius from 1999 to 2008 and not by the 0.2 degrees Celsius assumed by the United Nations Intergovernmental Panel on Climate Change. And, say the British experts, when their figure is adjusted for two naturally occurring climate phenomena, El Niño and La Niña, the resulting temperature trend is reduced to 0.0 degrees Celsius -- in other words, a standstill." The only surprising issue about the whole global warming scam was the number of fools who fell for it. Oddly, those opposing the sound principles of science and joining the global warming cult claimed to be supporting the whole scam "in the name of science". Don't worry, like in the 1970s they will be back with the global cooling scam. The same people who supported "global warming" will be supporting "global cooling" and deny they ever supported the former. The numbers don't lie. Nature doesn't lie. Satellite photos showing melting icecaps don't lie. Humans (like GW deniers) lie.